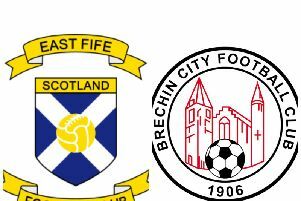 The home side were defeated by Barry Smith's Brechin. 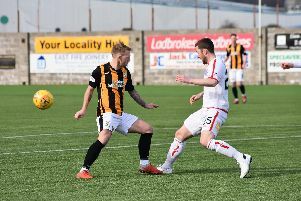 It was an afternoon when the Fifers were out of luck in front of the Brechin goal and guilty of conceding sloppy goals at the other end. On the whole this was far from a bad performance, in fact some of the passages of play moving up the park were terrific. It's all the more frustrating, then, that the visitors left with the three points following two goals the hosts will certainly feel were preventable. The first was a header direct from a corner and the second was just a total calamity at the back. Boss Darren Young felt his side merited more. He said: "I felt we dominated the game. "They had two shots on target and scored. "One was a free header from a corner and the other was comical from our point of view; the goalie runs out, Ross (Dunlop) passes it by him and their guy has an empty net. "We knew how they would come and play and that they'd be hard to break down. "We expected them to play that way and they did. "They stuck to their game plan and took their chances. "We had several chances ourselves but didn't take them and didn't hit the target. "We played some nice stuff at times but lacked that ruthlessness and cutting edge, which they showed." East Fife started well enough and Mark Docherty's dipping drive pulled a smart stop out of Patrick O'Neill. Pat Slattery was next up for the home side but he dragged his effort from the edge of the box wide. It was City who broke the deadlock, Dougie Hill heading home a Tam Scobbie corner. Jonny Court thought he had pulled the hosts level within minutes of the second half starting, but was left frustrated to see the offside flag raised. With East Fife pressing they were stung on the counter by Brechin. A hopeful long ball looked comfortable enough for the home defence but a mix up between Brett Long and Ross Dunlop allowed Ross Kavanagh to net probably the easiest goal he'll ever score. The Fifers tried to get themselves back into the game with Young introducing forwards Broque Watson, Kevin Smith and Rory Currie. Despite throwing everything at City in the closing stages, the visiting defence held out well.